C# 2012 Fundamentals LiveLessons Part I¿ is an introduction to developing applications in the C# 2012 programming language.¿ You begin by exploring the Visual Studio IDE.¿ Then you learn about core C# constructs, including classes, objects, and methods.¿ You move on to explore program control, and end with a lesson on exception handling. Paul Deitel is co-founder of Deitel & Associates, Inc. and co-author of the best-selling C# 2012 For Programmers, 5/e. He is a Microsoft C# MVP. In this LiveLesson, Paul starts by showing viewers how to set up a C# development environment. He goes on to cover core C# programming concepts, including strings, classes, objects, control statements, and methods. 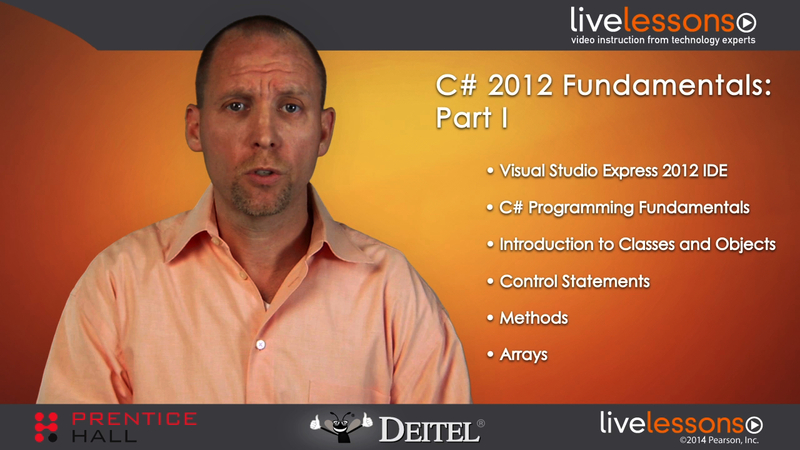 Paul ends the lesson with an in-depth examination of arrays in C#. 9.10 Card Shuffling and Dealing Simulation; Introducing Arrays of References to Objects and the ToString method.